"On Wednesdays We Wear Pink" is a quote from the movie Mean Girls. I saw a few bloggers started this "Pink Wednesday" trend as an ode to this awesome movie. I decided to join in, you can too if you click on the link! :) I remember clearly seeing Mean Girls when it came out. I saw it with my 3 closest friends Molly, Lisa, and Rachel I believe a few days before our high school graduation. This movie has spurred countless inside jokes ever since. I also remember this was the movie while exiting the theater I tripped on the last step and sprained my ankle, but it was well worth it! Not only do I like "Pink Wednesdays" for the Mean Girls reference, but I like it because pinks sometimes get brushed aside in the nail blogging world. I know of plenty of bloggers who don't care for pink or don't find pink original enough. I'm a pink fan, and I think Pink Wednesdays is a fun way to get some great pink polishes out there! Electro Candy is a neon hot pink with a blue-violet-green micro shimmer. This is a great pink. Normally, I'm more of a fan of neon cremes, but I'm really loving this neon with shimmer. It's the perfect amount of shimmer it's not overdone and really enhances the color without overwhelming it. I recommend it. 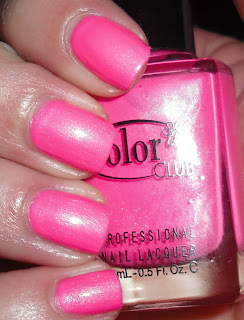 I got this one in the Color Club Electro Candy set at Ross. The set was $8 total. Great deal for 6 polishes + a top coat. I'm a pink lover and this one isn't excluded! I love the name of this polish. Electro Candy sounds & looks delish! Loving the colour! Me and you are on the bright pink train today obviously! Pretty! I'm so excited about Pink Wednesdays, lol.